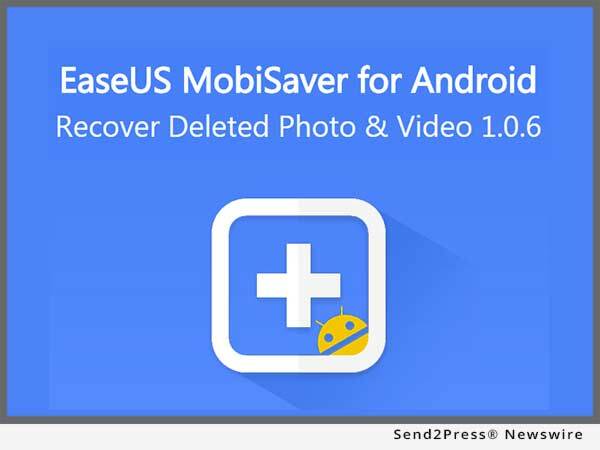 NEW YORK, N.Y., Jul 05, 2017 (SEND2PRESS NEWSWIRE) — EaseUS MobiSaver – Recover Deleted Photo & Video is a newly released app on Google Play to start file recovery on Android mobile devices. Like EaseUS MobiSaver for Android, Android data recovery software that helps to restore files deleted or lost in Android internal memory or SD card on Windows PC/laptop, this new mobile program gets this recovery feature to recover deleted photos or videos quickly and is available in Google Play now. Immediate data recovery from Android phones is out of many reasons like deleting photo albums of large sizes for low memory, cleaning up videos by mistake, installing system updates or rooting to get the most out of Android device without any backup or file sync. EaseUS deleted photo & video recovery app for Android users works effectively to solve plenty of data loss cases and get lost multimedia files back within few clicks on smart phones. Mobile has changed the way users take and keep pictures or videos. However, the space is limited to store data on smart phones. Data deletion or cleanup sometimes is inevitable to free much space for what necessary from SD memory card or internal storage. EaseUS photo & video recovery app for Android is an easy-to-use widget to restore files deleted or lost by accident in only three steps on Android devices no matter rooted or not. Just install the app on Google Play, then start scanning to search for lost data, and go for recovery after preview. Root access on Android is to exploit built-in features in Android system. It’s really worth rooting Android phones for all the goodies, like seeking hidden capability of Android, admitting permission to data, boosting running speed and backing up phones. This new Android app for photo and video recovery only gets access to deleted files and is able to search in-depth and find exactly what have been deleted: no worry about privacy and information leak. Compatible with Android 7.0, 6.0, 5.1, 5.0, 4.4, 4.3, 4.2, 4.1, 4.0, this data recovery app for Android makes photo & video recovery as easy as touches away on the tips of fingers. It’s much flexible to filter data in or after the recovery process by setup conditions, like file types, the created date of files and only displaying deleted ones. EaseUS provides professional IT solutions for home, education and SMB users, service providers in data recovery, backup, system optimization and partition manager on both Windows and Mac platforms. Founded in 2004, EaseUS has established itself as a fast-growing international company with over 100 million wonderful users in the world. For more information, please visit https://www.easeus.com/. “EaseUS” is registered trademark of CHENGDU Yiwo Tech Development Co., Ltd.